The Medical Oncology Clinic provides treatment and support for patients with several different types of cancers. Patients meet here with their medical oncologist – a doctor who oversees a cancer patient’s care from diagnosis through treatment and follow-up. Please ask your referring physician or hospital to have all medical records sent to UT Southwestern Medical Center. We will have access to medical records for any procedures performed at UT Southwestern. Because you’ll be getting a lot of information, it’s a good idea to take along a family member or friend to help you take notes and remember what the care team says. The Medical Oncology Clinic at Simmons Comprehensive Cancer Center is located in the Seay Building on UT Southwestern’s North Campus. Valet parking is available in front of the Seay Building. 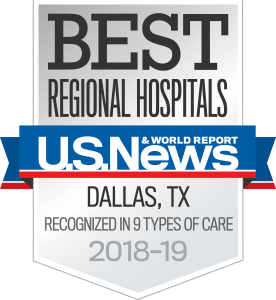 We are part of the Harold C. Simmons Comprehensive Cancer Center — the first and only medical center in North Texas to attain National Cancer Institute (NCI) designation. This elite distinction, which is held by only top-tier cancer centers nationwide, recognizes innovative research and excellence in patient care. It is the gold standard for cancer programs.